For all y’all that complained that Will Smith wasn’t blue when the first official Aladdin pix dropped; Be careful what you wish for. 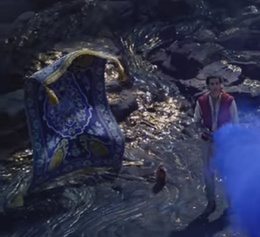 The new Aladdin trailer dropped, and truth be told, I am a little flabbergasted. I liked his non-blue look better. I saw the broadway show, where the genie is never blue, and I was real good with it. Needless to say, this new look is going to take some getting used to. But If Genie is charismatic and funny, fingers crossed, he’ll steal the show, like he’s supposed to. We also get to see Jafar, looking and sounding nothing like the sinister dude from the movie. Carpet looks cool though, and so does Abu, the monkey, and the regal pet tiger. And the colorful street parade looks like it’s from the big Prince Ali musical number. Which is also coolio. What do you think? -And before some of you start with the immediate Genie-hate. What did you really expect a big blue guy to look like anyway? Give it a chance. I still remember how people lost their minds when we got the first pix of the CGI Beast in ‘Beauty and the Beast’, and that movie turned out great. Let’s just ‘Wish’ for a fun film and a well-told story.